Floral Wood Decorative Box, "Tulips"
Tulips burst into bloom, coaxing azaleas to open their petals in camaraderie. 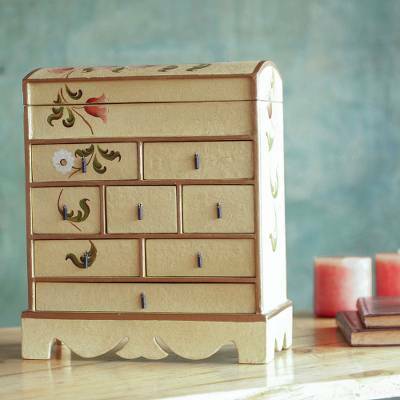 They adorn a chest designed for jewelry, keepsakes and personal treasures. Featuring eight drawers, wrought iron pulls and an antique finish, it is beautifully crafted by Antonio Rojas. Antonio Rojas has received 11 microcredit loans with 0% interest from Kiva and Novica, the first for $300 and the most recent for $1100. Proceeds were used to stock up on materials to craft his products, and also to invest in tools for his workshop. Keepsake Boxes Lovely Trinket Jewelry Box Treasure! I needed a jewelry box but I wanted something that I could keep out on my dresser, on display. This is such a lovely piece and I've received many compliments on it. Check out the other pieces in the collection also! "Lovely as the picture suggests"
Love this chest and can't wait to put all my jewelry from Novica in it!! "I'd describe my work as life itself, and my existence together with it. When I was only 17, I created my first piece in wood and it was a great pleasure, an immense satisfaction…." "Hola. I'm Antonio Rojas Colmenares and I was born in Ancash on January 28, 1970. Following our family tradition, I live my life amid wood and patterns to cut it into shapes. I then carve them and, although the work is done by hand, I try to give them a perfect finish. I join the pieces and then sand them to get rid of any imperfections. Next, I apply a base of chalk and latex to cover the wood's pores. I love to paint the colors after a careful and exquisite selection. I do this with very fine brushes in different sizes. Finally, I fix the tonalities, give the piece a sheen and add a layer of matte lacquer for an antique effect. "My pieces are filled with life from the olden times and reflect the style of vintage pieces. Although those times are gone, I continue with that tradition so as not to lose our identity. I try to transmit my love for life and for nature – its flowers, birds and all the rich flora and fauna of our country. "I'd describe my work as life itself, and my existence together with it. When I was only 17, I created my first piece in wood and it was a great pleasure, an immense satisfaction for its esthetic. Today I haven't stopped practicing my art as it guides my hands toward what my thoughts decide in that moment of pleasure as I stand before the wood." My giftee loved the Colonial Classic Fair Trade Cedar Office Accessory and Desk Organizer by Mr. Rojas and immediately took it to her office to use with pride. Hello! I just revived my beautiful Wood Jewelery Armoire ""Antique Peru"". I like it very much it makes my day . Thank you very much Joanna L.